Today my baby girl and I were lying on the sofa together, Briana sleeping on my chest. I closed my eyes for a while and let my mind drift. When I opened them again I found Briana’s little hand shaping a perfect ‘I love you’. Of course she had no way of knowing as she’s not even five months yet but it still gave me a wonderful feeling of connection. Tristan, who will turn four in two weeks, and I still sign ‘I love you’ to each other for example when I drop him off at school and he is waiting in line with his class mates ready to go inside. It’s our secret language and he does not have to feel embarrassed about it :-). Last Sunday my husband drove Tristan to my parents in Germany and I waved them off as they were leaving in the car. I waved and signed ‘I love you’; he waved and signed ‘I love you’ too. Oh I just love these moments. 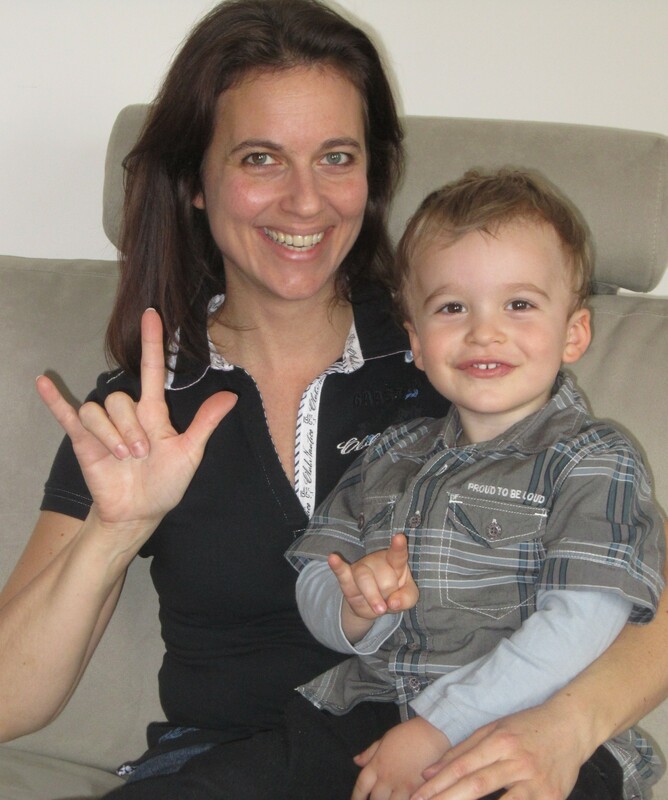 Speaking of sign language when talking is not an option: do you also catch yourself asking your child simple questions (e. g. yes or no questions) during meal times? I do and quite often my son has his mouth full when I expect him to answer. Of course I’m teaching him not to speak with a full mouth, so when it happens I encourage him to use his signs. This means I get my answer, he can keep eating and does not speak with his mouth full. I took my son to three sessions of physiotherapy last week. He has bronchitis and in Belgium it’s very common that the pediatrician prescribes physiotherapy which includes inhaling a salt solution through a special inhaler that pulses the humid air out at a certain frequency. Tristan has never had use this type of inhaler before. The therapist showed the machine to us and explained how it works. He then placed the mask on Tristan’s face and switched on the machine. I thought Tristan looked terrified (at least that is what his eyes communicated to me). I asked him if he was ok. Of course he was not able to speak so I told him to respond with the signs for ‘yes’ or ‘no’. He signed ‘yes’ and I felt much better knowing that he was ok. I kept reminding him that he could communicate with me by using signs. During the 3rd session, he signed ‘no’ about half way through the process and I immediately asked the therapist to stop the machine. It appeared that the therapist had pushed the mask against his face too hard. Once Tristan had been able to explain that, the therapist applied less pressure and Tristan was fine to keep going. I’m sure Tristan was happy that he was able to communicate with me and that we could take action to make him feel more comfortable immediately. My son, Tristan (3.5), has been exposed to letters and numbers regularly from when he was about 13 months old. Why is that? I teach the manual alphabet and numbers to the parents in my signing courses and they are repeated over and over again. The reason why I make the manual alphabet and the numbers a routine in my classes is that all of the signs I teach are based on a letter in the alphabet or a number. While I teach the parents, their children are also exposed to seeing the various hand shapes and hearing the letters and numbers as we sing the alphabet song and various nursery rhymes featuring numbers. Before Tristan started going to a daycare centre at the age of 2.5, I always took him along when I was teaching baby signing. For a long time he was fascinated with the letters of the alphabet and he often asked me to sing the ABC song for him. At 2.5 he was able to sing the song himself in English (with his two primary languages being German and Dutch). A little later he developed a fascination for numbers. When reading him a bed time story, he was more interested in the page numbers than the story. For about a year now, he knows that during the weekend we don’t get up before the clock shows 8:00. When we call granny, I give Tristan the numbers and he dials. Last week his granny taught him a game involving a regular dice, i.e. with dots indicating the numbers 1 to 6. It took Tristan only a few rounds of playing before he recognised the numbers without counting the dots. Every player starts with 8 wooden pegs. When I played with Tristan 2 days ago, he grabbed a handful of pegs for himself. I asked him how many pegs he had. He counted to 5. Then I said, ‘5, that’s right. How many do you still need?’. Without too much thinking, Tristan responded, ‘3’. I was speechless. During another round he gave me a handful of pegs and I counted 6. Again I asked Tristan, ‘How many do I still need?’ His answer: 2. No one had ever taught him to calculate. His little brain never seizes to amaze me. Before he really got into numbers, he was fascinated by the alphabet. Watch him sing the ABC song at 2 years and 5 months. Welcome to the world little sister! On Sunday 26 February I gave birth to our sweet little daughter Briana Elin. What a miraculous moment this very first meeting, the very first touch skin on skin and then holding her; welcoming her into the world. For a second time, precious emotions never to be forgotten. It was a very conscious and positive birth experience which left me with enough energy to enjoy and embark on the wonderful journey of bonding with Briana straight away. I had prepared Briana’s big brother, Tristan (3.5), as well as I could for her arrival and he seemed very excited about her ‘coming out’ soon. Of course you never know how an older sibling will react until the moment of that first encounter arrives. We were quite sure that he would give her a warm welcome and I was curious to see what he would say or do. When Tristan walked into the room, seeing his little sister in his dad’s arms, he decided to greet her with signing ‘brother’; sending shivers of joy down my spine. I asked him if he remembered the sign for sister which he didn’t but he wanted me to show him. Then he also signed ‘sister’ to Briana. What a sensitive little boy I thought. I had explained to him that it will take a while until Briana will be able to speak. He had not used his signs much since he turned two because he mastered his two spoken languages well enough by then. Realising that his sister will not be able to speak, he’s been practicing his signs again in preparation for the big day. Whilst we are still in the hospital, Tristan is with his grandparents in Germany teaching his grandma lots of signs to prepare her for ‘baby communication’ as well. It’s wonderful to see him so involved. That’s it for now, back to giving my full attention to my lovely daughter.